...because I LOVE JAPAN and I am going to be shooting a music video there!!!!! Crazy. So excited. Yay. Sushi. Hello Kitty! BACKSTREET BOYS WITH SPECIAL GUEST AVRIL LAVIGNE! Officially announced today, Avril will be touring with the Backstreet Boys in the USA this summer! Brian Littrell says: "Avril is an unbelievably talented artist who's a perfect fit to make these shows extra special for our fans." 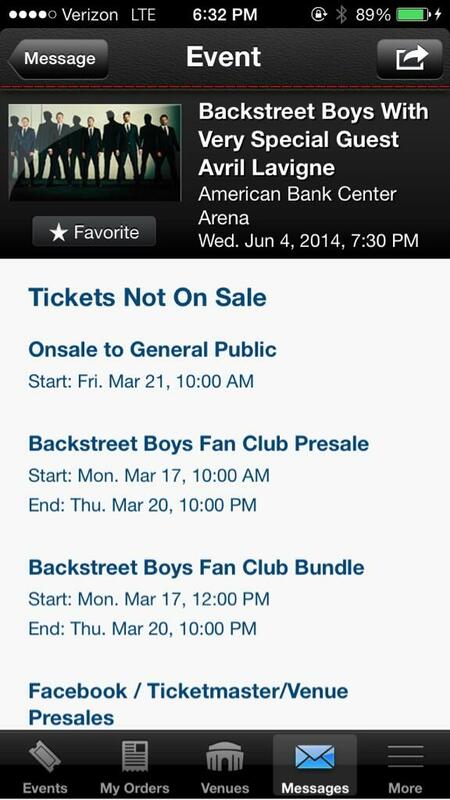 Tickets go on sale March 21 (Backstreet Boys fanclub presale March 17) through Ticketmaster. "THE AVRIL LAVIGNE TOUR" MEXICO DATES! Avril has announced tour dates for Mexico! AVRIL ON TOUR WITH.. THE BACKSTREET BOYS?? The Backstreet Boys have been teasing a big announcement tomorrow morning on Good Morning America, and based on searches on Ticketmaster, it seems that they will be touring with Avril! If you remember, Avril and BSB did some Christmas shows in the USA together, and even hacked each other's Twitter accounts (#AvrilBSBHack). We won't know anything for sure until tomorrow, but Ticketmaster is showing (thanks to @DeryckRolie on Twitter!) a tour date on June 4 in Corpus Christi, TX as "The Backstreet Boys with very special guest Avril Lavigne". Given that I have been obsessed with the Backstreet Boys for 17 years, I would be ecstatic to hear this news... What do you think? Would you be happy to see Avril tour with BSB? Avril has announced more tour dates for South America! "THE AVRIL LAVIGNE TOUR" SOUTH AMERICA DATES! Avril has announced April and May 2014 tour dates for South America! Avril announced via Twitter today that The Avril Lavigne Tour will be heading to Brazil! No dates or more details, but they will be to come soon. AVRIL'S SHAVES HER HEAD - AGAIN! Not gonna lie, her hair is so beautiful and I'm not liking this look but Avril has once again shaved the side of her head. This picture was posted on Instagram, along with the caption: "Gave Ferlazo a haircut today! #letthemknowthatwearestillRockNRoll #tourhaircutsbyAvril"
Avril has confirmed via Twitter that there will be 2 new singles, for 2 different regions of the world. One confirmed will be "Hello Kitty" for Asia, and we still have yet to hear of confirmation of the other. Are you excited? Which ones would you like to see as singles?